Up from the shores of the Albermarle came a lad to the hills of Rockingham, in 1905. Frank C. Cowan enrolled in the Leaksville-Spray Institute where he studied until 1907, when he went to work with American Warehouse, now Fieldcrest Mills, Inc.
On October 25, 1911, he married Etta Crews of Germanton, the daughter of a Baptist preacher. Mr. Cowan served his church from 1932-1949 as Chairman of the Board of Deacons, when he was retired from the board temporarily because of the institution of the Rotating System of Deacons. In 1915 he began teaching, and continues to teach what is now known as the Adult Bible Class. He has served his church faithfully and well in many capacities through these many years. This History is dedicated to the memory of Rev. C. A. Jenkins, D. F. King, B. F. Ivie, Dr. T. G. Taylor, Mr. And Mrs. J. B. Taylor, Miss Lottie King (Mrs. S. J. Beeker) and other members of the Leaksville Baptist Church who retained their membership in the Leaksville church, but spent much time and work in developing the Spray church. It is likewise dedicated to the following who moved their membership and became charter members and leaders in the new church: L. W. Clark, J. F. Lewis, W. D. Flynn, C. J. Land, Cabell Jones, C. B. Austin, M. A. Trent, Dr. and Mrs. John Sweaney, Mrs. D. G. Robertson, A. E. Millner, Daniel Patterson and others. As the sands of a half century run out, we rise up to honor all these whose love for Christ and vision of the Baptist possibilities in the town of Spray wrought nobly for the organization of the Spray Baptist Church on October 25, 1903. Under Divine leadership and in keeping with the Great Commission, the Leaksville Baptist Church sponsored a mission then known as the Spray Mission. We do not know on what date the mission was organized, but we do have a record of the mission work during the years 1902-1903. Rev. S. J. Beeker was pastor of the Leaksville church, and of the mission at that time. Members of the Leaksville church who took part in this new work were: Dr. T. G. Taylor, Superintendent of the mission, D. F. King, B. F. Ivie, Mrs. And Mrs. J. B. Taylor, Miss Lottie King (Mrs. S. J. Beeker) and others. On October 25, 1903, the mission was organized into a church of sixty-three members by the Leaksville church with Rev. 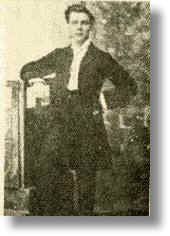 C. A. Jenkins, pastor of the Leaksville church and mission at that time. The name of the church was to be the Spray Baptist Church. The following officers were elected: Clerk--M. A. Trent, Trustees--John F. Lewis, Dr. John Sweaney and Albert E. Millner, Treasurer--L. W. Clark, who served until his death in 1932, Pastor--Rev. 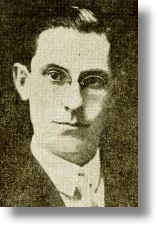 C. A. Jenkins. The first building to serve the church was a one room structure seating about two hundred people, located at Spring Street and Park Road. 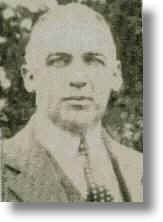 A charter member of the church, who served as Treasurer and Chairman of the Board of Deacons until his death in 1932. He was also Sunday School Superintendent for twenty-six years. His Christian influence was felt in many ways in Community, Associational and State-wide work. On April 7, 1904, a committee was appointed to find a full time pastor. The committee consisted of Dr. John Sweaney, L. W. Clark and John F. Lewis. On April 28, 1904, the church was called into conference, L. W. Clark presiding, for the report of the pulpit committee. Dr. Sweaney made a motion that Rev. 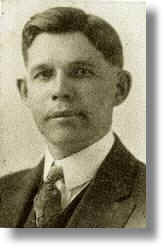 J. M. Stanford of Stoneville, North Carolina, be called as full time pastor at a salary of six hundred dollars per year. This motion was carried unanimously. Mr. Stanford served the church nearly eleven months, and endeared himself, individually and collectively, to all the church and community, impressing upon all that he was a faithful and diligent worker in the Master’s vineyard. It was his desire to see built in the immediate future a new house of worship, suited to the needs of the growing church, so that a strong and useful church work could bless the community; but Mr. Stanford did not live to carry out his plans. 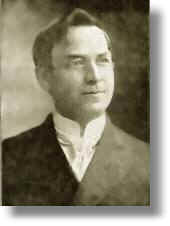 Mr. Davenport came from Graham, North Carolina, to the church in the Autumn of 1905. Upon arrival he found L. W. Clark, W. D. Flynn and others of the church family very much interested in building a new church house. He, too, was interested in the erection of a new church, and made a contribution of twenty-five dollars for the building He did not stay long with the church and consequently, did not do anything in the building program. His ministry lasted only about one year. He resigned the work here in the spring of 1907. During the interim between the closing of the pastorate of Rev. J. E. M. Davenport and the coming of Rev. S. J. Beeker, the church asked Charlie Austin, one of our own young men, a ministerial student at that time, to supply the pulpit, which he did very acceptably. Charlie endeared himself to all the church and the whole community that his ministry still lives with us. Rev. 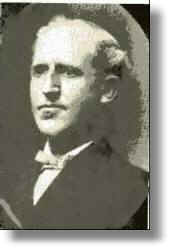 S. J. Beeker was pastor of the Leaksville Baptist during the years 1902-1903, and was pastor of the Spray Mission at the same time. He moved to Leaksville from Pitcairn, Pennsylvania. In September 1907, the Spray Baptist Church extended a call to Mr. Beeker, who accepted, and on November 1, he returned to the pastorate on the church. The church had been planning to remodel the church building and had hoped to have it well on the way when Mr. Beeker arrived, but a delay in the shipment of the lumber blocked the work, and when the materials came the country was in the grip of a financial panic, and those who were at the head of business affairs saw that it would be all they could do to pay for the lumber at that time. Mr. Beeker was a young man, and having been on the field before, he rapidly got things in hand. He wanted to go forward with the building, since the church was being filled to its utmost at all times. However seeing the condition of financial affairs, he very wisely refrained from urging the burdening of the church with a debt at that time. The spiritual condition of the church was good. During the year there were ninety-two additions. The prayer meetings were well attended by the young people. Mr. L. W. Clark, Superintendent of Sunday School, and his teachers, were doing a fine work. The pastor refused to let the pulpit be vacant at any time, and everybody knew that the church would be open for every service. Mr. Beeker’s ministry was during a hard time, financially. Many people were moving away to other places, because the mills were running short time, and people were making very little money, but the much desired remodeling of the church building was accomplished before his pastorate ended. Mr. Beeker was an excellent preacher and pastor, and did a great work in the church and community. He resigned the work on February 5, 1911, and became President of the Leaksville-Spray Institute. On August 27, 1911, the church was called into conference, Mr. L. W. Clark, chairman of the Board of Deacons, presiding, for the purpose of calling a pastor. After prayer for guidance of the Holy Spirit, a motion was unanimously carried to call Rev. W. E. West of Kernersville, North Carolina to be pastor for one year at a salary of fifty dollars per month. Mr. West began his ministry with the Spray Baptist Church October 1, 1911. The work progressed very nicely under his leadership with good spiritual condition and growth in numbers. When he had finished one year for which he had been called, the church very readily extended to him a call to remain another year at a salary of sixty dollars per month. The pall of indebtedness occasioned by the remodeling of the church cast a shadow over Mr. West’s ministry. Money was no so very easy to raise during these days but little by little, the church kept moving in the right direction. Mr. West did not stay to finished the building indebtedness. On June 15, 1913, he offered his resignation to take effect June 30, 1913, which the church in conference voted to accept with regret.